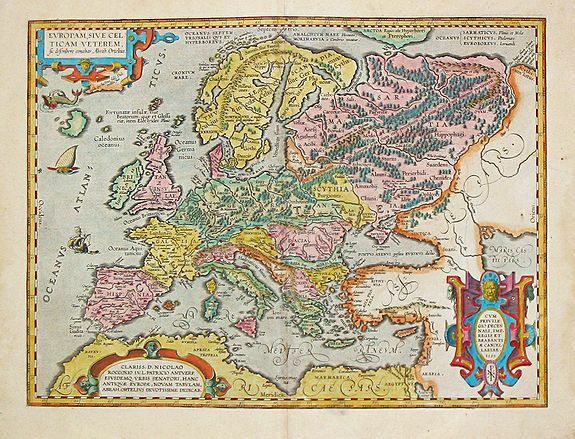 Old map by Ortelius -[Antique map of Europe] Europam, sive Celticam Veterem. 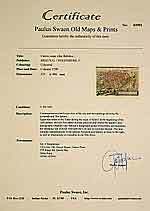 Title: [Antique map of Europe] Europam, sive Celticam Veterem. Size: 14.0 x 18.8 inches. [Antique map of Europe] Europam, sive Celticam Veterem. Theatrum Orbis Terrarum in 1570. Editions till 1612. Also an atlas of ancient cartography, the 'Parergon' and a pocket atlas, the ' Epitome'. An attractive map of Europe, according to the Romans. Embellished with three strap work cartouches. From the extremely rare Spanish edition of Abraham Ortelius’ ‘Theatrum Orbis', published by Robert Bruneau. Reference: v.d.Broecke, Ortelius, map 189, Karrow, Mapmakers of the 16th Cent., 1/200..